Can you believe we are into 2015 already! WOW! I hope 2014 left you with wonderful memories and the next year adds many more! Here at Canadian Scrapbooker Magazine we look forward to bringing you lots of inspiration between our pages, on our blog and through social media! We hope you continue to share with us! So without further delay, let’s get into our first creative space of 2015 in our weekly feature on the blog: WHERE YOU CREATE! We are visiting Susan Richter, in Nova Scotia! 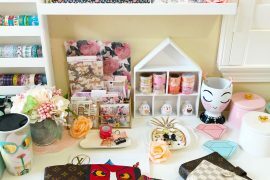 I want to share some pictures of my favourite room in our house….my craft room! 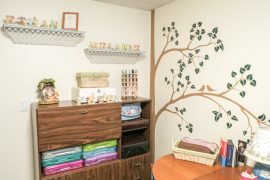 When my husband and I began working on plans to build our very first home, 4 years ago, a craft room for me was a must have. We studied many floor plans before we finally came up with the perfect one, and I love how it turned out. This colourful space would keep you organized and inspired! My craft room on the main floor, with a half-wall door opening, isn’t closed off. It allows me to watch my son playing with his toys in the living room while I scrap happily in my space. On occasion he will come in and create with me, making a card, a poster, or sometimes even work in his own art journal. Along with my son, I also share this room with my mother. She lives close by, so we combined all our scrap tools and supplies into one space. She comes over whenever she likes to work on her own projects. The desk area is actually a kitchen countertop. We purchased a discounted pre-cut countertop from the local hardware store; my husband fastened legs on it. The countertop for a craft desk is such an awesome idea! Love all the light coming in through he window as well! Most of the storage pieces are JetMax furniture from Michaels, but I have one coveted piece – a stand-alone paper rack that we purchased from a local scrapbook store that went out of business. I miss that store, but I will always have a little piece of it with me! I like to display a lot of art in my space. It makes the room very much mine because it’s filled with all the things I really love. It inspires me to create. I hope you like it as much as I do and thank you for all the rooms you share on your weekly feature. They are always full of great ideas! looks great, here’s to lots of creativity in 2015! I’m always trying to get my supplies organized but I haven’t made it yet. Mine are in the corner of my dining room. I will get there one day! I would love having a larger window in my craft room! Well done, it looks great! PS also love the paper tower!